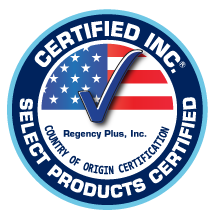 August 10th, 2014 – Storm Shield is pleased to announce that it’s Window & Door manufacturing facility REGENCY PLUS INC. has been “Made in USA®” approved and certified. Made in USA Certified Inc. completed a rigorous supply chain audit to ensure that its material components and originated and finished goods have been processed in the United States. “This was a detailed project which required us to look at every individual component in every window and door. We are extremely excited to be able to offer this to all of our customers. We will be very proud to place the ‘Made in USA Certified’ label on our products,” said Gary Fanelli , President of Regency Plus, Inc.